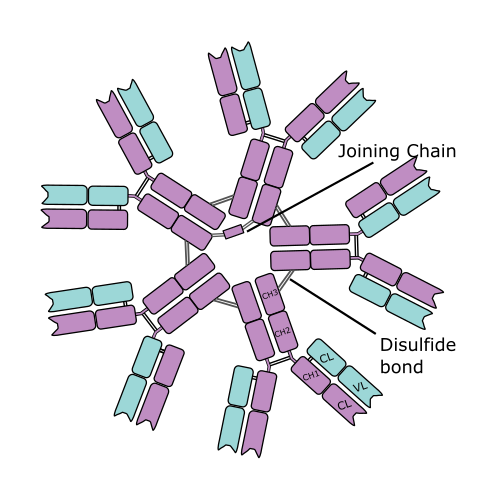 IgM is the largest antibody, and it is the first antibody to appear in the response to initial exposure to an antigen. IgM is constructed of five or six units (i.e. mostly as pentamers but also hexamers occur) which are each comprised of two heavy-chains (mu-chains) and two light chains, bound together by disulfide bonds and a so-called J-chain. is present on B cells and its main function apparently is the control of B-cell activation. B-cells create IgM antibodies as a first line of defense. Their large size gives them excellent binding avidity, and can pick up trace amounts of infection to mark for recognition by phagocytes. is primarily found in serum and due to its size, it cannot diffuse well, and is found in the interstitium only in very low quantities. Interestingly, it is also the primary antibody against A and B antigens on red blood cells and responsible for the blood-clotting reaction during blood-transfusion from wrong donors. has 10 binding domains for different antigens; however, not all of these sites can be occupied at the same time due to limitations in space. has a molecular mass of approximately 900 kDa.